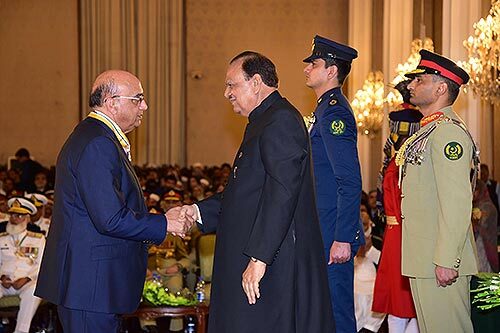 Bestway Group Chief Executive Mr Zameer Choudrey has been awarded the Sitara-e-Imtiaz (Star of Excellence), conferred on him by the President of Pakistan on 23rd March 2018, in recognition of his contributions to advancing Pakistan through his services and the wide array of philanthropic work. The ceremony was held at the Presidency on Pakistan Day. Mr Zameer Choudrey is a Fellow of the Institute of Chartered Accountants in England & Wales. He is an Honorary Doctor of Civil Law from University of Kent. Mr Choudrey was appointed Commander of the British Empire (CBE) in the 2016 New Year’s Honours list for services to the wholesale industry and philanthropy by Her Majesty the Queen. He has been responsible for transforming Bestway from a predominantly wholesale business into a diversified global conglomerate. Bestway Group today consists of Pakistan’s largest cement manufacturer (Bestway Cement Limited) and Pakistan’s second-largest private bank (United Bank Limited), UK’s largest independent wholesaler (Bestway Wholesale) and the UK’s third-largest retail pharmacy (Well Pharmacy). Bestway is the UK’s eighth-largest private company with diverse global interests that generate a turnover of US$5 billion per annum with profit before tax of US$630 million per annum. The group employs 34,000 people globally out of which a workforce of 22,000 is employed in Pakistan and contributes more than US$425 million annually to Pakistan’s national exchequer. Mr Zameer Choudrey chairs the Bestway Foundation Pakistan and also chairs the UK Advisory Council of the Prince Charles British Asian Trust. He is a founding trustee of Bestway Foundation UK and is a long serving Trustee of Crimestoppers UK and GroceryAid UK. The philanthropic arm of the group, Bestway Foundation was established in 1987 in the UK and later in 1997 in Pakistan. Certified from the Pakistan Centre for Philanthropy, Bestway Foundation supports many national charities, educational institutions, societies and trusts in Pakistan and abroad, in addition to supporting many natural disaster rehabilitation and relief efforts, providing free medical facilities to more than 35,000 patients in the local communities annually, while valiantly protecting and creating a healthier environment for all. Since its establishment, over 500 students have been provided scholarships to pursue higher studies abroad primarily in the UK, USA and Canada. The Bestway Foundation Pakistan annually provides 300 scholarships to students across the country. Bestway is also offering 12 fully-funded scholarships every year for deserving and talented Pakistani students in the Oxford University, University of Bradford and University of Kent in the UK. Bestway employs hundreds of trainee engineers, management trainees and apprentices every year, who undergo intensive training in their respective field. Since 1998, Bestway Cement has trained over 2,500 apprentices in order to enhance the skills of the local community. To date Bestway Group has contributed nearly US$34 million to fund the charitable activities of national and international societies and endow projects of communal uplift in the countries in which it operates.